The Blue Apron Pizza Cooking Show: Starring YOU! In honor of Thanksgiving, we’re sharing what we’re thankful for: OUR HOME CHEFS! Thanks to all of our members for letting us into their kitchens so we could make the latest Blue Apron Cooking Show. Last winter, we made a cooking show featuring our Beef Ramen. 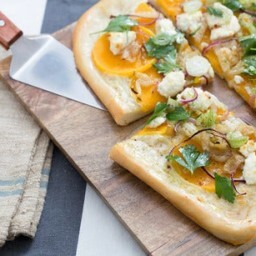 This time around, our vegetarian Butternut Squash & Goat Cheese Pizza is taking over your kitchens. Without further ado, let’s turn it over to our home chefs!